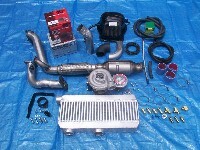 Stage III shares all components with the Stage II kit with the addition of a few special parts. Stage III is for people that want to get the most out of the stock motor. The stock fuel injectors are only large enough to support 8-9psi. After that point, larger injectors and more sophisticated engine management equipment is needed. Since we are trying to keep things �Simple and Effective�, the Stage III kit is a true bolt on kit that will get the most from a completely stock motor. Larger T3/T04B turbo � The Stage III turbo has a larger T4 compressor. A larger compressor is more efficient and will deliver more higher rpm power. This turbo still offers VERY fast response with no noticeable lag, allowing the boost to come on by 3000rpm. This unit allows you to tune the most out of the motor without worrying about detonation. 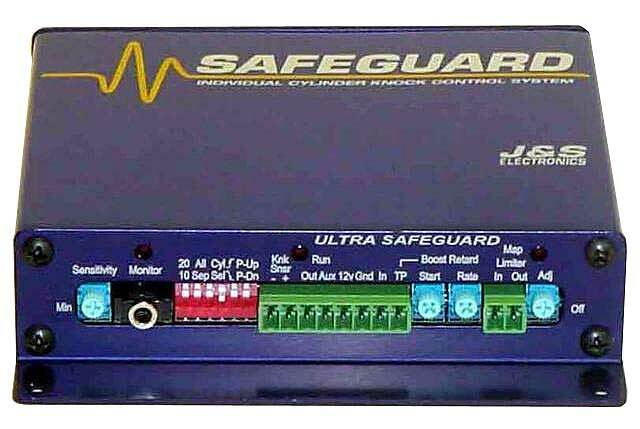 The Safegaurd comes with a knock sensor and automatically retards the timing on an individual cylinder basis to eliminate the detonation. This unit WILL save your motor if something happens that causes a lean condition. What would normally result in a damaged motor will be just a momentary loss of power when the J&S automatically retards the timing. AWESOME!! For more information, please visit the J&S website. It is VERY informative. MOROSO Oil Catch Can � Run the crankcase vent hoses to this external oil separator so there is no chance of oil getting �blown� into the turbo inlet. Cartech Model 20002 - All models that are equiped with a MAF (pre 2000)get a Cartech RRFPR that does not start to raise the fuel pressure until 7spi of boost. The MAF and ECU will provide enough fuel up to 7psi, then the RRFPR kick in to add more if the boost is raised to 8 or 9psi.